An interesting article called “Divided Attention” by David Glenn talked about how multitasking influences our skills at what we are doing. The quality of what we do goes down. He discussed something he called “the illusion of competence”. Heavy multitaskers often have this illusion that they are able to do all their tasks just as good together, as they do them independently. Even though multitaskers are very confident in their abilities, frankly a bit too confident, there is evidence that they are actually worse at multitasking than most people. A study conducted in Stanford University found that people who reported themselves as heavy multitaskers did worse on cognition and memory tasks that involved distraction than people who reported that they prefer to work on single tasks. Is it possible that frequent multitasking affects brain plasticity in a way that reduces its attention skills? 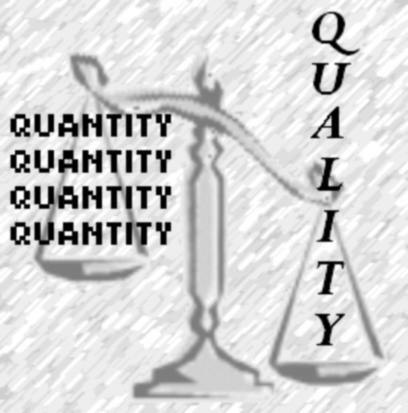 Do people who regularly prefer quantity over quality start to lost quality over time? It is true that multitasking reduces quality, and as the name implies it increases quantity. Why take such a pessimistic negative view on things? Maybe multitasking is good. Maybe sometimes you need to do many things at the same time in order to get things done. Doing your homework while checking Facebook certainly isn’t a plus to the way you’re doing your work. But maybe it’s okay to iron the clothes while talking on the phone and listening to music. An article written by a few psychologists from UCLA said that multitasking is fine, just as long as you don’t do it if you’re trying to learn something new, or if you’re doing something that you want to remember well. So if you’re studying for a final, don’t multitask, you won’t remember the material properly. If you’re learning how to drive, don’t open the radio and drink your coffee, just focus on driving. In most cases however, if you focus on quantity at the stake of the quality of your work, you're sacrificing not being smart. We need to retune our minds to focusing on things one at a time in order to properly do them better. Doing many things at once takes a longer time, so focusing on your to do list one by one would not take a very long type theoretically speaking. We all know how we multitask when we don't feel like doing the things we're doing by themselves. When I don't want to write my paper, and I don't feel like listening to my friend tell me about her boyfriend for hours, I decide to do them at the same time. I call her, throw some umms and ahs here and there, and try to write my paper. Of course, then I haven't given her properly attention, and my paper has been written horribly. Do not choose quality over quantity when it's something that you're doing something that you're planning to turn in, learn and remember, or use later for something important. 1. Glenn, David. "Divided Attention." The Chronicle of Higher Education. 28 Feb. 201. Web. 4 May 2011. <http://chronicle.com/article/Scholars-Turn-Their-Attention/63746/>.